Geek's Guide to Britain Adastral Park is BT’s global research and development centre, one of the world’s most pioneering centres of technology and telecommunications. Like other visitors to the area, I’ve gazed at the Le Corbusier-inspired building and its iconic tower cube rising out of the surrounding flat Suffolk farmland. It announces its modernising mission to passengers staring out of the windows of cars hurtling along the A12 past Ipswich and on to the east coast. The site has a rich history of military invention and technical achievement, and is now home to thousands of engineers not just working on the frontier of boffinry but also turning new ideas into practical services. 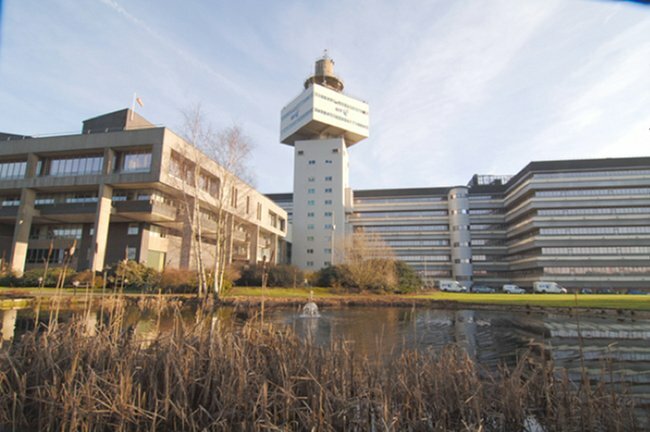 BT calls Adastral Park “the home of UK broadband”, and some insiders claim there’s enough high-powered telecoms and computer kit on site to “run Belgium” – which is just a short hop across the North Sea. The park is a place that BT will open up as a science campus and a Suffolk ICT cluster if development plans are approved. Yet the public knows relatively little about the site’s rich history or what’s there now. That’s mostly because Adastral Park can only ever be a name to you for now – it’s off-limits to most visitors. A glimpse from the A-road is the closest most will come. As part of The Reg’s Geek Guide to Britain, though, I was welcomed to the machine. But, let’s go back to the beginning. The site has a long history of innovation. At the dawn of flight and aerial combat, a Royal Flying Corps aerodrome was established in 1916 in the village of Martlesham Heath. This became the Aeroplane and Armament Experimental Establishment, the main RAF airfield for the testing of prototype aircraft between 1924 and 1939. It witnessed the first flights of the Spitfire and the Hurricane. In World War II it became an operational airbase and home to fighter aces such as Douglas Bader. In 1942 the airfield was taken over by the US Air Force and became the location of experimental military ballistics, electronics, rocketry, turbo engines and landing equipment before it was decommissioned in 1965. Soon after the RAF moved out, the Post Office Research Laboratory relocated to Martlesham from Dollis Hill in London. The new telecommunications arm of the Post office had blossomed since the end of the war, and Suffolk offered plenty of space for experimentation by physicists, chemists and engineers who had been instrumental in crucial projects such as the Colossus computer. The open local countryside was ideal for testing radio-based communication systems. By 1975, site was officially opened as BT Laboratories by the Queen, with the iconic tower building housing 1,700 BT Research staff. Prestel, the world’s first interactive commercial "videotex" data subscription service, was launched at Martlesham in 1979. In 1982, shortly after BT was privatised, its research site hosted Europe’s first satellite transmission service, run by Eutelsat. BT Research demonstrated the world’s first instant speech recognition and translation service in 1987 and as early as 1995 BT trialled a video-on-demand (VoD) service to thousands of customers in nearby Ipswich and Colchester using ADSL-over-copper to early set-top boxes. From 1999 work to extend optical fibre transmission led to the launch of the UK’s first commercial broadband internet service in June 2002, turning what had long been an academic technology into an engineering reality that British organisations, businesses and consumers could use. Today, the renamed Adastral Park is BT’s global innovation and development centre, an engineering HQ that takes top-flight technology and works out how to deploy and operate it the real world. It is a modern science park with more than 43 companies on site including some of the biggest names in IT: from Fujitsu and Ericsson to Samsung to Cisco. The site is also one of two worldwide Network Management Centres for BT Group, providing a 24-hour “follow-the-sun” service - the other being in El Segundo, California. It’s also home to 4,000 IT professionals, 3,700 working on research, design, operations and consultancy. As “the home of UK broadband”, much of the work conducted on-site continues to explore the physical limits and practicalities of deploying a national standards-based super-fast broadband network at scale: how to actually get fibre to customers affordably and with the best possible performance. Everything BT rolls out onto its network is tested to full operational standards across Adastral Park before it is deployed. In effect the park hosts a £500m scale model of BT’s full global network, replicating every single piece of kit developed by BT and its interoperable vendors and suppliers – from cables and routers to digital multiplexers and telephone exchanges. After negotiating a secure registration area, my introduction to Adastral Park was a landscaped campus surrounding that iconic Orion building and Pegasus tower complex. Many of these buildings are dedicated to research; its teams are trying to overcome communications challenges such as delivering fibre networks to telephone masts, monitoring conversations on social networks to improve services for customers, or designing smart communities and cities. Crucially, there is a real engineering function sitting behind the proof-of-concept systems. Next page: Trip around the closely guarded "Four Acre Site"